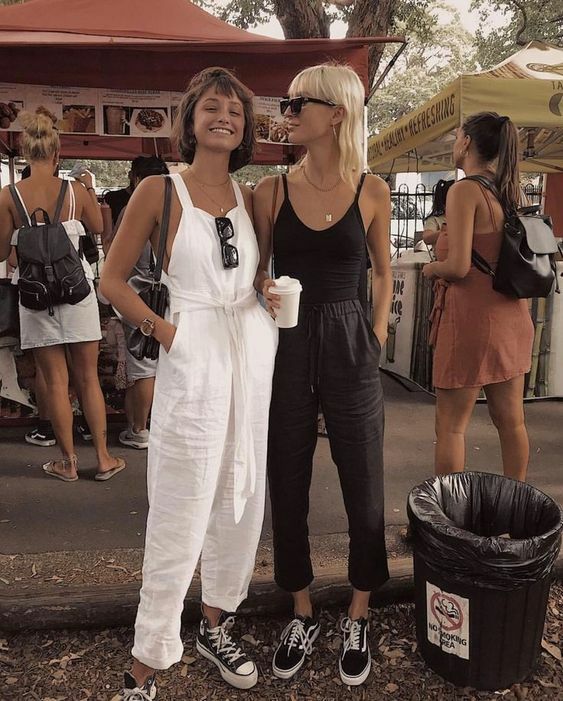 Why romper when you can jumpsuit? A jumper with long legs is just as cool in the heat and are seven times more figure-flattering. This season’s summer jumpsuits are boasting shoulder-baring tops and wide leg bottoms. Every girl must add one to her summer wardrobe! A one-piece is perfect for packing a minimal carry-on or overnight bag. Total vacation BFF! If you like a little more coverage, a modern, striped onesie with short sleeves is magnificent. Summer jumpsuits should look carefree and casual and look super cute with flats. They are easy to accessorize, too. Add one of our favorite straw hats and your trademark sunglasses and your all set! We love the skate style and girls who rock low top Vans or high top Converse are #1 in our book! A jumper is perfect for a date night too. Opt for summer jumpsuits that have romantic touches, like ruffles along the collar or sleeves. Anthropologie has a sweet terracotta number that looks terrific cinched at the waist with a wide belt. Keep your hair up with one of our favorite hair scarf ideas and make sure jewelry is super minimal. You’ll be so comfortable in your own skin, your inner beauty is bound to radiate! Music Alert! I am so digging my summer playlist these days! Here’s a gem from Francesca Lombardo that will have you bouncing in 3 seconds flat. The key to pulling off a jumper is to make sure it has an extremely relaxed fit. Summer jumpsuits should have ample room to move in. Make sure the waist is generous and flattering and the pant legs are super flowy. Culottes are extra cool and look amazing paired with this season’s low sandal styles. H&M has a cute striped bandeau jumpsuit for under $60. The woven crepe fabric and fantastic fit make it suitable for work or cocktail events. We love a cropped leg! To keep the look long and lean, choose vertical stripes in the leg or a monochromatic color. Make your wardrobe stretch with summer jumpsuits in warm, vibrant colors like mustard and rust. The perk of these color palettes is that you can wear them after Labor Day! Take a look at this Polka Dot Long Jumpsuit from Mango. Polka dots! And super cute buttons down the front, we die. Summer colors that fold into Fall just make sense with any budget. Are you jumping on our all white, minimal, monochromatic bandwagon yet? Nothing makes skin look more radiant than summer jumpsuits in head-to-toe white. Add a wide, flowing pant leg and you’ve got yourself a stand-in for a maxi dress! For a jumpsuit worth a splurge (or just to drool over), check out Halston. Their high-neck jumpsuit is super disco and will shake, shake, shake with you all night long. No need for jewelry and keep hair and makeup au natural for best effects. These easy one-pieces are also super perfect for vacation outfits. 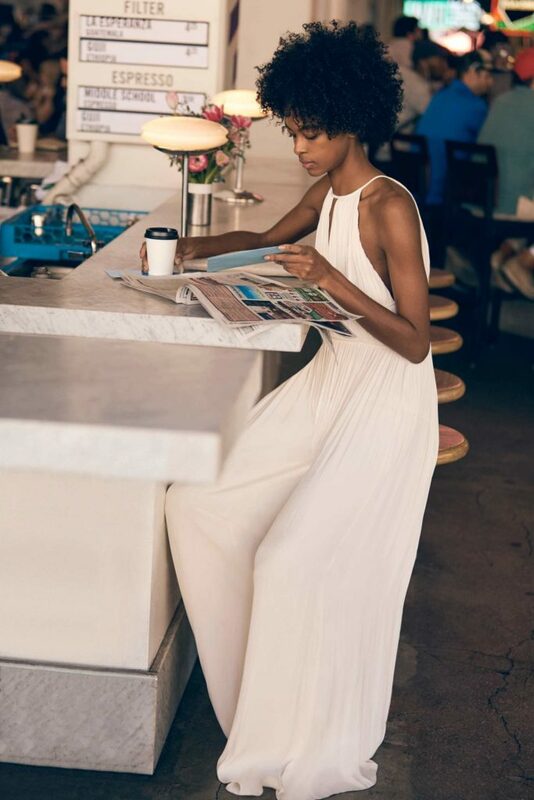 Summer jumpsuits in cotton or linen are so comfortable and keep you extra cool. We love these guys with tiny spaghetti straps, so you don’t have to stress tan lines. Or, you can ditch the straps all together and sport a flattering bandeau style beauty. Lovely with coin necklaces and easy braids in your hair. So carefree! When you try on a jumpsuit, make sure it fits perfectly in the waist. Belts, or belted waists on summer jumpsuits are essential and should be super flattering. If a jumper is a little snug, always feel free to try on a size larger. It’s better to have a little room and let it hang right, than to be too tight around the hips and thighs. Finally, keep the emphasis on effortless. These should look like you are as comfy as in a pair of pajamas (and feel that good, too!). 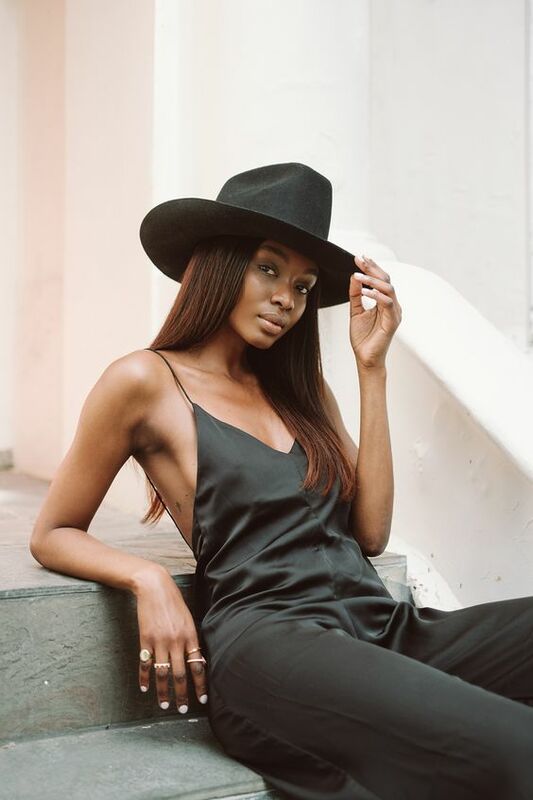 The black jumpsuit and cowgirl hat! !